Salisbury, Md. — As part of overall master planning objectives for the waterfront, Davis, Bowen & Friedel, Inc. (DBF) assisted the Town of Onancock with Phase I improvements to the Wharf Area on the Onancock Creek. With the goal of providing boaters and recreation enthusiasts with high quality and memorable experiences, highlights of Phase I include renovated vessel mooring slips for larger boats; replacement of aging fixed timber finger piers; and safer access to slips and boats by incorporating a floating dock and floating finger piers. 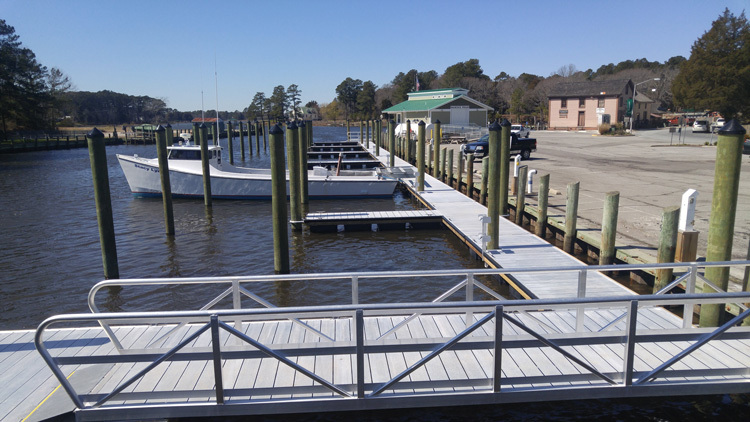 Sixteen existing fixed timber finger piers were replaced with 12 larger floating finger piers and approximately 230 feet of floating dock, including an ADA accessible ramp on the easterly end and a standard access gangway opposite. Eight of the new slips can now accommodate 40-foot-long vessels and four of them can accommodate 30-foot vessels. DBF also aided the town in obtaining a grant from the Virginia Port Authority (VPA). Several alternative concepts were prepared, and a recommended option was selected to present to the VPA. Bathymetric and topographic surveys were completed by DBF and concept plans were converted into design drawings, from which an application was also made to the U.S. Army Corps of Engineers (Norfolk District) and the Commonwealth of Virginia Marine Resources Commission (VMRC) to obtain permits for the proposed work. Since the existing fixed timber finger piers and mooring piles extended into an existing federal channel, permit review meetings were conducted at the Norfolk District Corps of Engineers that included the town, DBF, the Corps and the U.S. Coast Guard prior to final acceptance. “With these improvements we are creating safer, more efficient and functional boating access for visitors,” said Project Manager Ken Eaton, LEED Green Associate.